Toufik Sarwa, the man behind Yorkville hotspot Amber, is also owner of the new resto-bar Cinq o1 (located at College and Bathurst). Opening Cinq may have been met with a few challenges after Toufik stated 'it's my 2nd restaurant and my last. It took me 10 years to open another one.' 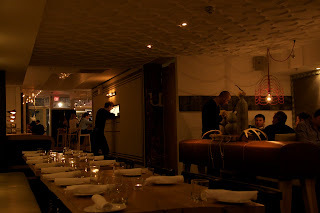 But the hard work is sure paying off with a bustling bar and a fun menu of mostly comfort food. Below are some snapshots of dinner. To start we ordered the split pea soup, the chickpea fries, truffle mushroom pizza, the shrimps and the mac & cheese with duck ham and black truffles (which can be found under the sides). The commentary is like an episode of Top Chef. Like.